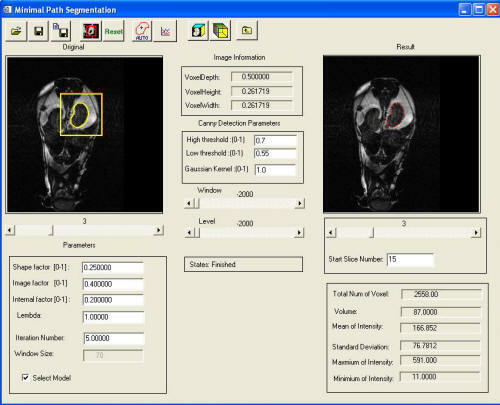 The improved minimal path segmentation method is an automated, model-based segmentation method for medical Images. The method’s energy function combines distance and gradient information to guide the marching curve and thus evaluate the best path. Dynamic programming was used to automatically optimize and update end points in the procedure for searching curves. A deformable 3D model was generated as the prior knowledge for selecting the initial end points and for evaluating the best path. The software program has the following features: (1) define a ROI and then search the contours of the object within the ROI; (2) automatically segment multi-slice; (3) calculate the quantitative value such as the mean intensity, standard deviation, pixel number, area of each slice, and the whole volume, (4) incorporate a prior model as an initial contour into the segmentation, and (5) generate a prior model using samples. Figure 12. Graphic user interface (GUI) of the automatic segmentation software.